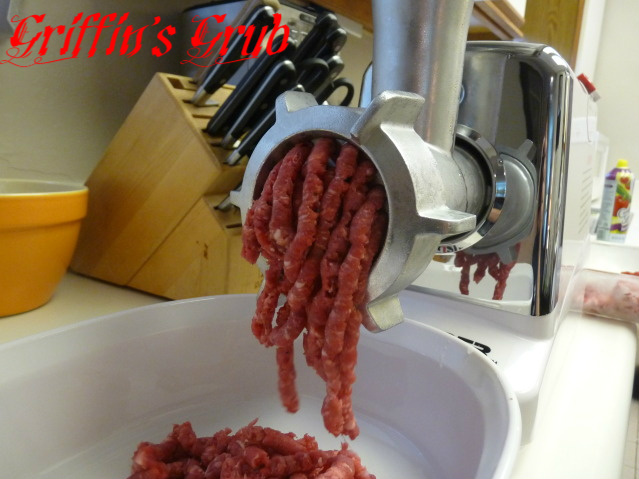 I’ve been dying to use my meat grinder ever since I got it for Christmas, but things have been busy around here and I just haven’t had the time. When Mrs. G told me yesterday that she wanted a burger for dinner, I knew it was on! Time to break out the grinder and get to grinding! So why would a person want to grind their own meat? There are many good reasons. You have no idea what you are getting when you buy store-bought ground chuck. Was the meat from a lower grade animal? Was it old or sub par? How much fat is in there? And what cuts went into it? By grinding your own meat, you can select the cuts of beef you use and the grade. You can also make sure that it is done in a safe manner and that there is no bacteria present. You can determine how much fat you use. And you can add your own seasoning and grind them with the meat. For my first attempt at grinding my own burgers, I was going to go simple and just use chuck. I selected a nice 3.34 lb roast and was about to head up to the register to make my purchase, when a nice skirt steak caught my eye. I guess I’m not good at keeping things simple as that 1.08 lb skirt steak jumped into my basket. Not sure how it would affect the flavor, but figured why not? 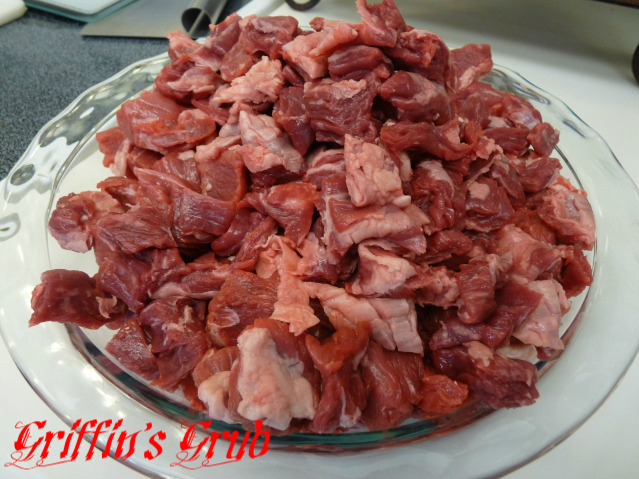 I went home and cut up my meat into about 1″ cubes so that it would fit down the neck of the grinder with ease. I was then going to simply season it with salt and pepper, but once again, I couldn’t leave well enough alone and some garlic powder, onion powder and Dizzy Pig Cow Lick made it onto the meat before I put it into the freezer for 30 minutes (along with the blades and internal parts of the grinder). Reading up on grinding meat, I learned that heat is your enemy and you want to do everything you can to keep the process cool. You want to put your meat into the freezer for about 30 minutes before grinding it, because if it gets warm, the fat starts to melt and will not grind well. Freezing the parts of the grinder also help keep the fat and meat from warming up and melting. Not to mention, keeping the meat cool helps prevent the growth of bacteria. So after about 30 minutes, I was ready to start grinding. It is not easy to take a picture with one hand while trying to grind meat with the other. Can you believe I got this on the first shot? 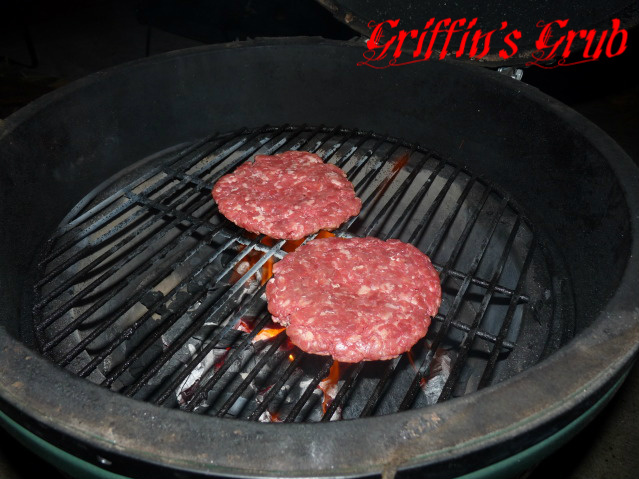 After I finished grinding up the meat, I weighed it out and divided it up into about 10.5 oz packages (two 1/3lb patties per package) and froze them for burgers later on down the road, while leaving enough out to make two burgers for dinner. I don’t usually make my patties so thin and wide across (who am I kidding? I don’t usually make the patties, that usually Mrs. G’s job), but when I got home I realized that the artisanal buns I got were kinda big. I fired up the Egg to 500F and cooked them for about 4 minutes a side and dinner was ready to be served. 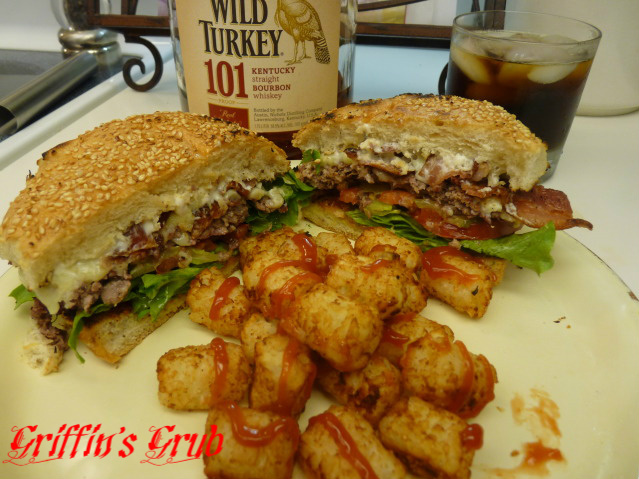 I fixed up my burger with bacon, lettuce, tomato, pickles, white American cheese, mustard, mayo and ketchup (yup, I do all three and I don’t really care what you think) and served it up with some tots. Love me the tots. All in all, this was a great cook. I finally got to break out the grinder and it was a lot easier to use than I feared (now I can’t wait to try my hand at some sausage). Although the burger was pretty tasty, the 75% chuck to 25% skirt steak may not have been the best combo for the perfect burger. I can’t wait to try my hand at grinding in some other cuts and see what I can come up with. Maybe brisket, or short ribs or even ox tail next time…..
Looks good to me! In fact, everything here makes me want to eat — and pop a cold beer. You might consider chuck tender (or chuck eye steaks) in the grind. Mixed 50/50 with top sirloin should give you some decent meat/fat ratio and plenty of beef flavor. Thanks Adam. I’m going to play around with different cuts and see what I like. I’ve been getting a lot of suggestions for brisket. Brisket makes a good ground. If you like beef, you’ll like it. Plus, it’s easier to find/organize than multiple cuts; and you can buy a big untrimmed one. You know what kills me about fresh grinding burgers is the cost. Don’t get me wrong, fresh ground is safer, better, etc. But when I’m buying the cuts of chuck or whatever else and see how much more it costs than ground chuck, I get tempted to buy the preground stuff, ha ha. But who knows what kind of meat they’ve put in it? Or what the real meat to fat ratio is? The main reason I got the grinder is that I want to start making sausage, but I thought I’d give grinding out burgers a shot and see how I liked it. 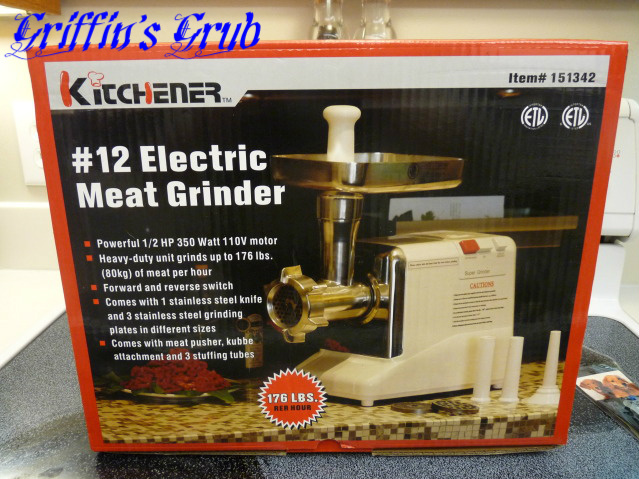 Grinding your own meat is such a great idea! I’ve never done it myself, but now you’ve got my gears turning, so to speak. 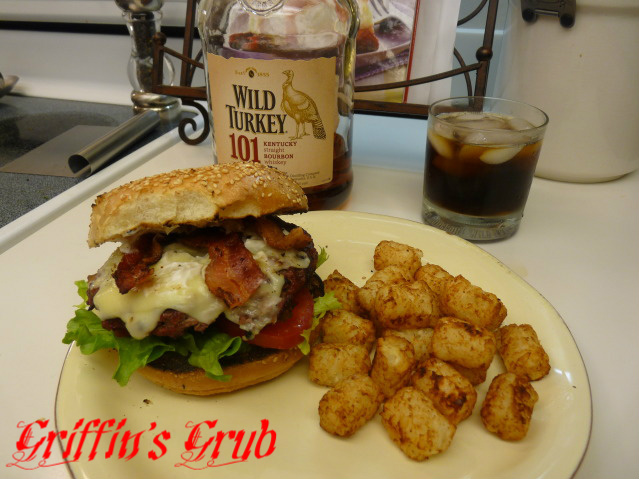 I love a really good burger, but rarely make them myself because I hate to buy pre-ground beef. I’ll have to look into the options for grinding at home. Thanks for sharing! I get sirloin (aka flapmeat), boneless short rib (chuck) and brisket (my addition) at Costco. Their meat is either choice or prime. I chop the meat to 1-2 inch cubes, lightly freeze it then use my food processor to pulse to the right consistency. Occasionally, I also grind in some applewood bacon. I carefully shape them into patties and freeze what we aren’t going to use right away. 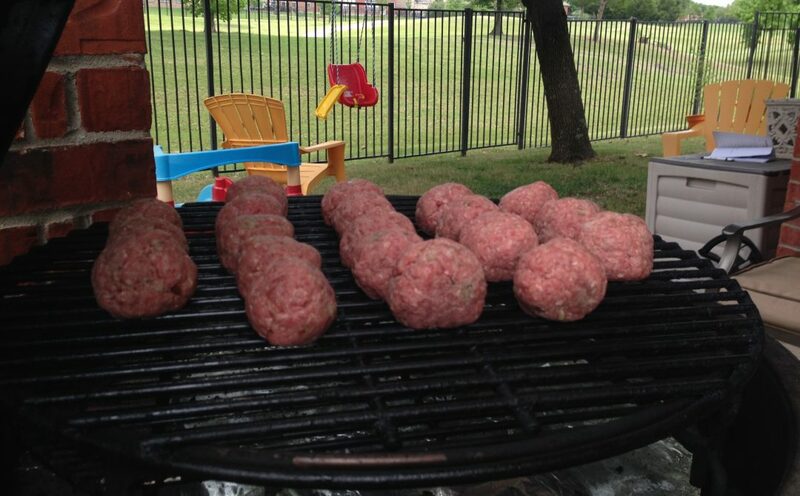 Many people suddenly show up at my house on Saturday when they hear I’m making “the burgers”. I got the recipe from Americas Test Kitchen. It was their version of the Shake Shack burger. Here’s a link to the recipe that doesn’t require you to sign up and/or pay for it. I hope you try it. Thanks. That does sound great.I love experimenting with different cuts to see how they come out. I seriously need to look into getting a freezer for the garage for all this meat and sausage we have been grinding up.